Manufacturers are increasingly choosing composites instead of metals in various structures to reduce weight as well as to protect against corrosion. 3D woven fabrics, in particular, have been used in a variety of structures, from marine hulls and coal scrubbers to downhole fracking components and ballistic and blast protection. 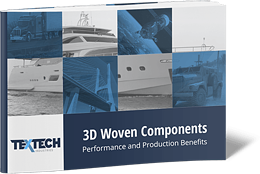 Fill out the form to download your copy of the eBook and learn about the benefits of 3D weaving capabilities.